Some time ago I wrote a rather lengthy and perhaps tedious piece on leadership. Joseph Nye, in today's Globe and Mail, makes my main point rather more succinctly here. I'm still wrestling with the Stéphane Dion conundrum. I've defended him (sort of) here. But I'm at war with myself. I may have to re-think my position about leadership, prompted in part by the gut-feeling I have every time I see a picture of that man, or listen to him speak. It's not the craven Liberal capitulation in Parliament over the past several months. That's not just Dion, it's his caucus and the Liberal Party in general. We tend to over-personalize the misbehaviour of an entire group in one individual. (In the case of Harper, that's not entirely wrong-headed. He micromanages to the point of autocracy. But he's an exception to the general rule.) But is that over-personalization avoidable, even with a radically different notion of leadership? I think not. Because, while the "big man" warrior-leader decried by Nye is long overdue for a replacement, a leader must, just for the sake of efficiency, be the human face of his or her group. It's a question of communication. We need to see in that person, not super-human qualities, but sincerity. When the leader speaks, we need to be able to connect, to grab what he or she is saying at a visceral level as well as an intellectual one. Now, check out that picture, above. This is Dion, in Alberta, addressing a gathering of an endangered species known as the Alberta Young Liberals. Never has Stetson sat upon a more unwilling head. And the shirt.... Look how uncomfortable and self-conscious he looks. Is there a difference, then? I would say yes. The too-tight leather vest has become almost an icon. But I do like Harper's expression in the photograph. This is beyond self-consciousness. He looks irritated, as though he'll have a word with his stylist after the shoot. 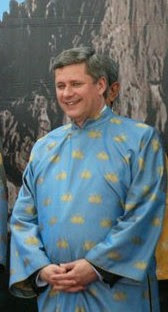 The second photo, of Harper wearing an ao dai, the national dress of his Vietnamese hosts at the time, captures one of the exceedingly rare occasions in which Harper is utterly disarming. 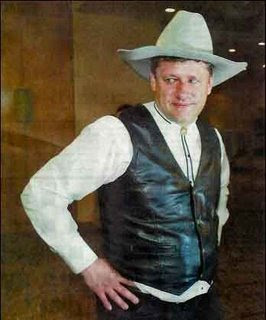 He's so obviously in costume, and just as obviously, he's so aware of how un-Harperish he looks, that he's actually smiling. Let us consider this waiter in the cafe. His movement is quick and forward, a little too precise, a little too rapid. He comes toward the patrons with a step a little too quick. He bends forward a little too eagerly; his voice, his eyes express an interest a little too solicitous for the order of the customer. Finally there he returns, trying to imitate in his walk the inflexible stiffness of some kind of automaton while carrying his tray with a recklessness of a tight-rope walker by putting it in a perpetually unstable, perpetually broken equilibrium which he perpetually re-establishes by a light movement of the arm and hand. He applies himself to chaining his movements as if they were mechanisms, the one regulating the other; his gestures and even his voice seem to be mechanisms; he gives himself the quickness and pitiless rapidity of things. He is playing, he is amusing himself. But what is he playing? We need not watch long before we can explain it: he is playing at being a waiter in a cafe. It's not that the Stetson and the shirt don't become him. It's that we have no clear idea of what would. And the same goes for his words. I'm not referring here to his incomplete grasp of English. (I wish my French were as good as his second language; when I once upon a time did have to deliver speeches in French, I invariably needed a script.) I'm talking, once again, about his tone, his delivery, his sincerity. We don't expect Harper to be spontaneous. That would be most un-Harperesque. Indeed, lack of sponaneity is part of Harper's tightly-wound personality. He's comfortable with that, or appears to be, which is what matters. But Dion's lack of spontaneity is matched by what invariably appears to be discomfort. Certainly some of that is his difficulty with English. But even in French--well, judge for yourself. Every time the party faithful dutifully applaud, he looks like the professor he is, waiting for the classroom disturbance to end. He even gulps noticeably at one point. We don't need warrior leaders, "big men," autocrats at a non-existent helm. There is no "ship of state." We need to ditch metaphors like that, recognizing that leadership, paradoxically, is a collective phenomenon, and we need to design new paradigms of leadership more in keeping with the demands of a complex state apparatus, not to mention a society. The old images of leadership are obstacles to be overcome. But all that being said, the public face of a leader is an essential aspect of the role. He or she needs not only to utter, but to be heard. A leader's apparent belief in his or her own words, a leader's evident confidence, a leader's ability to convey the living ideological to head and heart, is an essential part of the transmittal process. Harper doesn't shine in the latter respect. His public leadership is badly flawed. 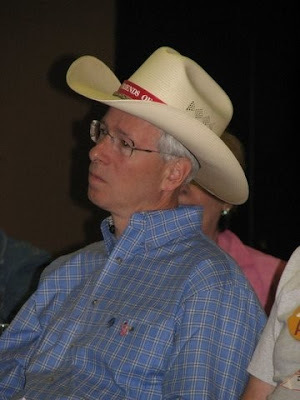 But regrettably Stéphane Dion, at least in this respect, is not a leader at all. UPDATE: (July 12) There's a post up at CC's place that reinforces my point, albeit tangentially. What kind of leader feels constrained to boast about his academic credentials? This page contains a single entry by Dr. Dawg published on July 11, 2008 12:32 PM. Bizarre Globe editorial of the month was the previous entry in this blog. A nation of sheep is the next entry in this blog.